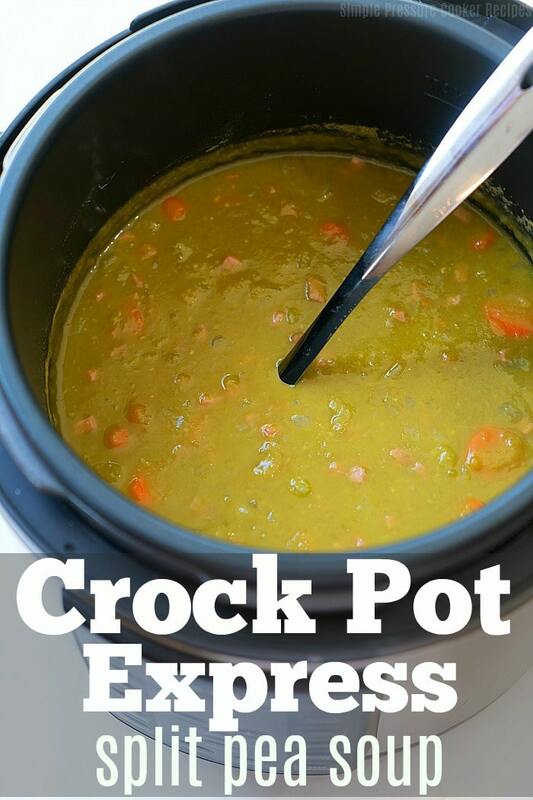 If you’re looking for a really easy Crock Pot Express split pea soup recipe I have it for you! Throw everything in your fancy pressure cooker including dry peas and it is done in just 18 minutes! Fresh homemade split pea soup has never been so easy and tasted so good, it will be your favorite too I bet! I don’t have a lot of time to cook nowadays. 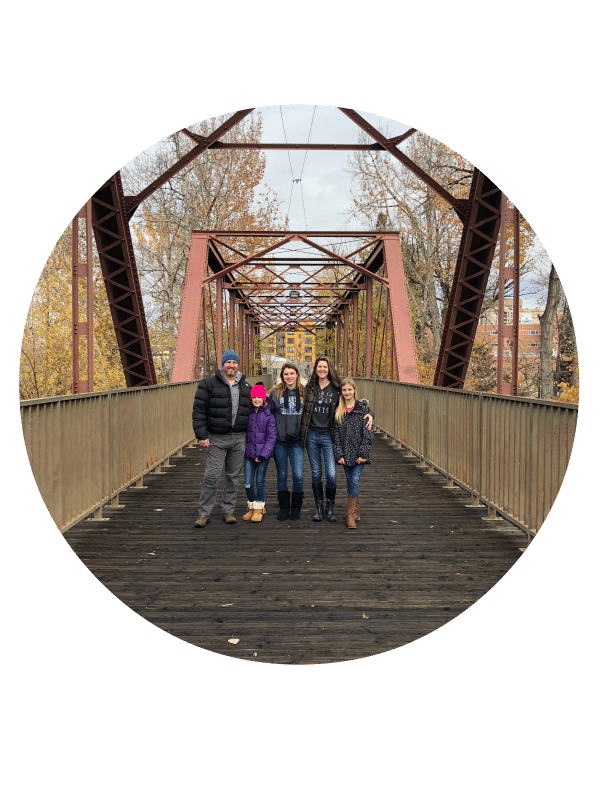 With three kids and working full time it means that meals have to be done in less than 30 minutes, but I still like to make homemade soups and dinners whenever possible. 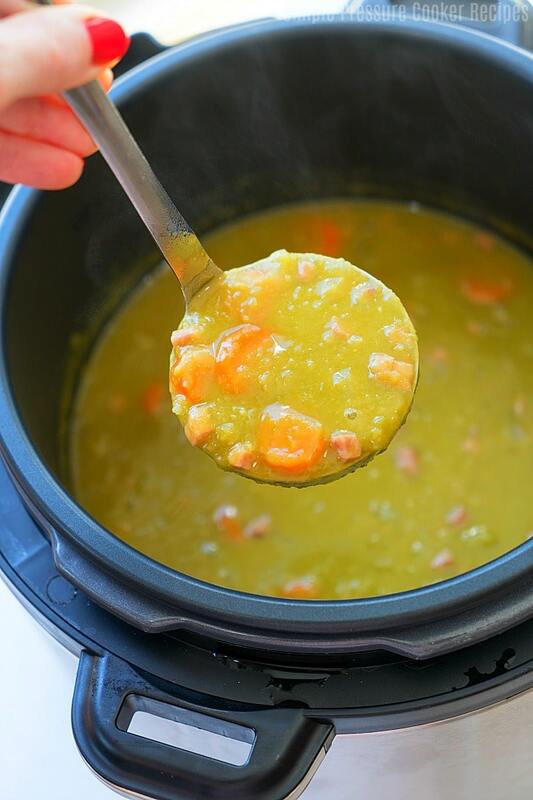 If you have one of these fancy pressure cookers too you know what a lifesaver it is and I assure you you’ll love our easy Crock Pot Express split pea soup recipe as much as we have. It is one of many comfort food meals listed on our Crock Pot Express recipes page here on Simple Pressure Cooker Recipes. This is what you do first. You just want to saute/brown the onions a bit so they soften before adding all the other ingredients. This really is a healthy soup that my oldest daughter asks for regularly (and we’re having it for lunch right now). You can pack it full of vegetables. We added 1 carrot and 2 stalks of celery for this batch but add as many as you like. As for the tenderness of the carrots it is up to you. If you like them really soft then slice them thinner and thicker for a firmer texture. As for the smoothness that is your preference as well. We like a little texture left with the peas so 17-18 minutes is great timing. If you want them REALLY cooked down I’d set it for closer to 19 minutes but the longer you cook it the softer the other veggies will get so keep that in mind. Keep this recipe handy for chilly days or when you want a feel good comfort soup for dinner. Just pair it with some warm rolls and you have a complete meal! Looking for another great meal? If you're looking for a really easy Crock Pot Express split pea soup recipe I have it for you! Throw everything in your fancy pressure cooker including dry peas and it is done in just 18 minutes! Fresh homemade split pea soup has never been so easy and tasted so good, it will be your favorite too I bet! 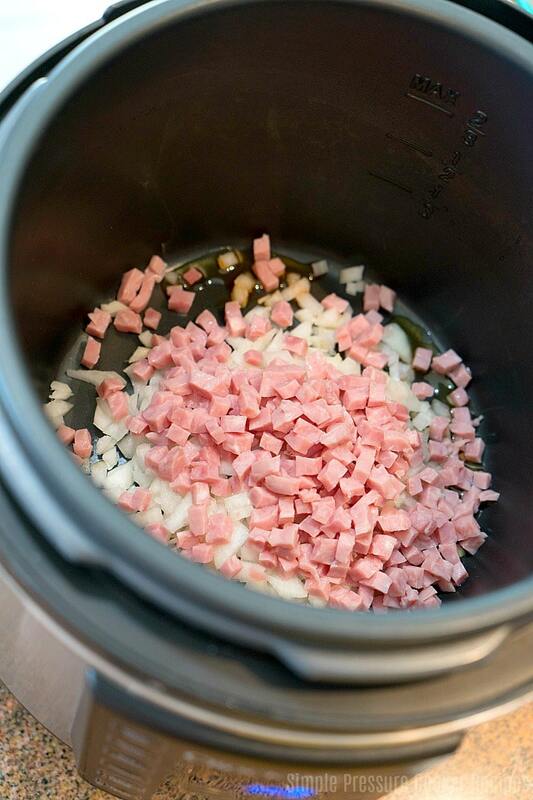 Turn Crock Pot Express to the brown/saute function and add olive oil, diced onions and ham. Cook down a bit until onions are softened. Press stop button to turn off. Add all other ingredients listed and stir. Set to soup setting (high is automatically chosen for you) for 18 minutes. Do a quick release and enjoy, can sprinkle more salt on top if desired. Try first and see if you want more (we like as is). Usually you need to soak peas over night. You use dry peas in this recipe and you dont soak them. Do you think that soaking is useless procedure when using the pressure cooker? I will try you recipe asap, sounds delicious! No there isn’t a need to presoak using an electric pressure cooker, that is what makes it so great! Greetings from Idaho Typical Dad!